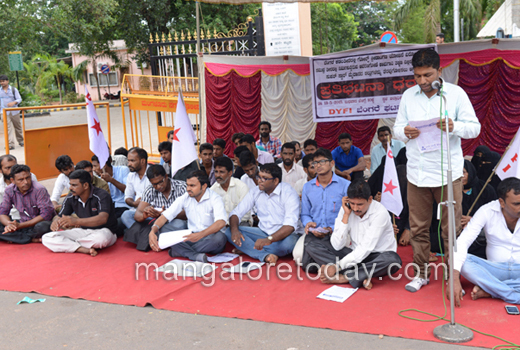 Mangaluru, May 13, 2015: The DYFI staged a protest in front of the Deputy Commissioner’s office in the city on May 13, Wednesday to pressurise the government to drop the Golf Course and luxury resort project proposed at Bengre with private participation. 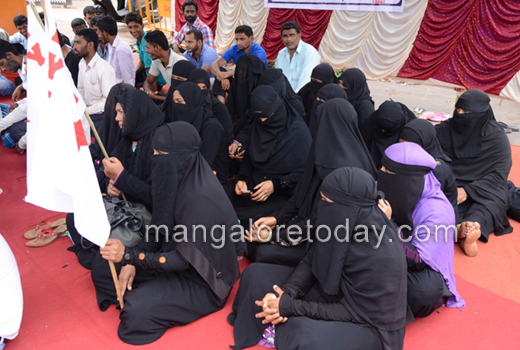 The protestors also demanded that the authorities immediately suspend the works of raising a compound wall on the sea shores by a private company and Tourism Department as part of the proposed project. 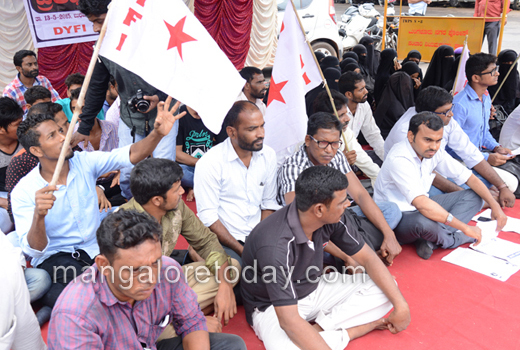 Other demands placed forth by the protestors are to secure justice to the poor fishermen families of Tannirbavi, Kasaba Bengre, Kudroli Bengre and Thota Bengre who are facing injustice at the hands of the Tourism Department. Title deeds, door numbers and electricity connections were also demanded to many families of Bengre which are deprived of the same. Measures were also sought to supply pure drinking water to Bengre and also to appoint adequate staff and also to provide amenities to the Primary Health Centre at Bengre. The memorandum submitted to the DC has pointed out that the Tourism Department has permitted a private company to set up golf course and resort named Opus Laguna Golf and Resorts Pvt Ltd at Bengre beaches and that 135 acres land has already been entrusted to the company by the government. With the company now initiating the construction of a compound wall, it would detach people of Bengre from the sea with which their lives are closely associated, the memorandum said. The memorandum also pointed out that several poor do not have land while many who have constructed houses here are not provided title deeds. Over 50 houses also do not have electricity connections, while door numbers have not been issued to over 1000 buses. The government which has failed to provide basic amenities to the poor was however helping the rich to enjoy their leisure in a luxurious way, the DYFI alleged. 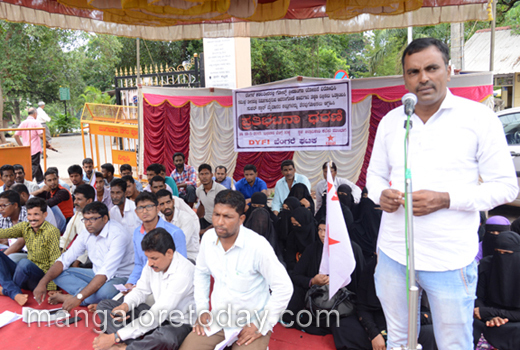 DYFI State President Muneer Katipalla, BK Imtiyaz, city unit President, AB Naushad, President of the Bengre unit of the organisation and many others participated in the protest.